Author: Becker, John Set In . . . Description: How does a curious cheetah cub explore the startling wilderness of the Serengeti Plains without his mother’s protection? 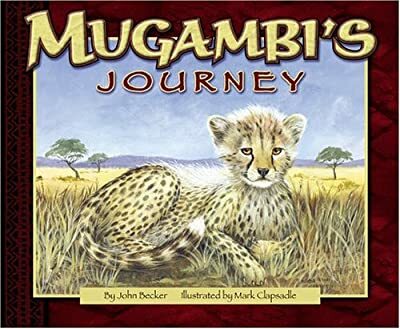 Mugambi, whose name means brave explorer in Swahili, discovers danger in this exciting, unfamiliar world as he leads his young sisters from the safety of their den to search for their mother. Richly detailed illustrations framed by borders of beautiful nature-inspired patterns typically found in the Serengeti region depict this fascinating endangered animal in its natural habitat. John Becker has written over 20 books for children. Working with wildlife expert Jack Hanna in the field of conservation inspired him to travel throughout the world to observe and write about endangered animals in their natural habitats. As a frequent guest author in schools, he inspires children to write creative nonfiction and fiction stories that focus on the natural world. John lives in Delaware, Ohio, where he is currently working on a series of first readers about wild animals. Mark Clapsadle is a graduate of The Art Institute of Pittsburgh and has over 30 years experience as an illustrator and fine artist. Throughout his career, he has illustrated numerous children's books and has received awards for his fine art, which ranges in subject from aviation to wildlife.